Road trips demand road trip food. You know the sort of junk food that you might not bring into your home on a regular basis, but that makes the perfect fuel for hours of night driving. A recent work trip necessitated some serious road food to make it through. 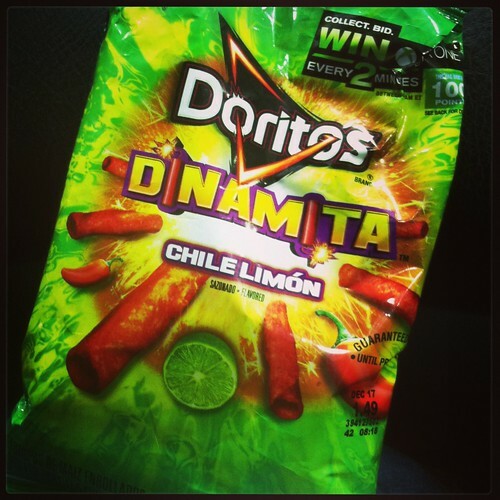 When I found myself in a convenience store during the wee hours starring down a display of Doritos Dinamita, I had to snag a bag . . .
Let’s start with the shape. These rolled Doritos are tubular rather than triangular and are a good bit crunchier than your standard Dorito. They’re also an alarming shade of red as opposed to a shocking shade of orange. As for the flavor, when they say chile they aren’t playin. These chips are picante with some lingering heat. How much heat? Enough heat to slow you down from eating the whole bag in a single sitting and that alone is worth the price of admission. Would I buy these again? Absolutely. I’ve Been Baking . . . Challah! Check Out Good Eggs + Learn Trade Secrets!